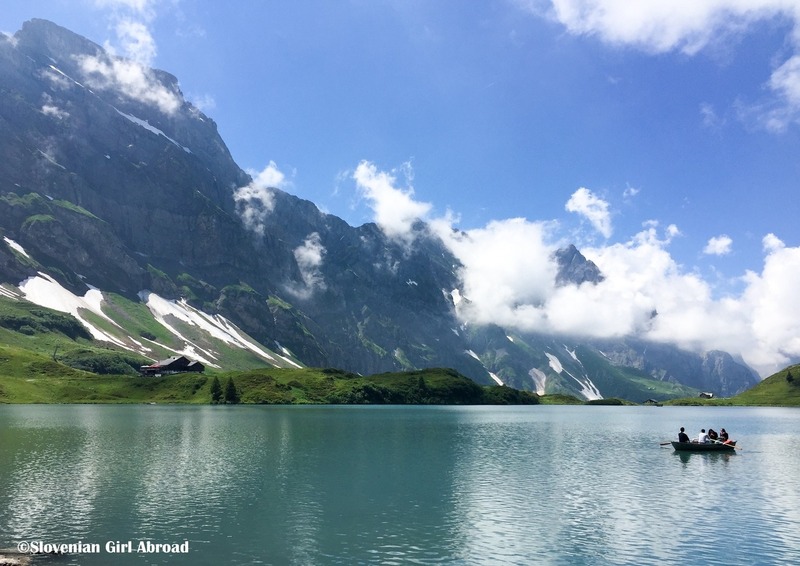 The starting point of the 4-Lake Hike is Melchsee-Frutt, which is accessible via cable car or hiking trail from Stöckalp. From Melchsee-Frutt the hiking trail runs along the Lake Melch (Melchsee) to the Tannen Lake (Tannensee) – the only artificial lake among all the four lakes. This part is with some light ascents and descents the easiest part of the trail. It is also very scenic as it offers some great views over both lakes and the surrounding mountains. If you’re lucky, as we were, you might even spot some marmots along the way. Easier alternative to hiking this section from the cable car station to Lake Tannen is taking the shuttle “Fruttli Zug” from the mountain station of Melchsee-Frutt cable car to Lake Tannen. From Lake Tannen the path descents to the Engstlen Lake (Engstlensee), to me the most beautiful lake of all four. This part is quite narrow, but is well secured and offers some great vistas one the way. At the Engstelnalp you can take a break at one of the restaurants or continue your walk to the Engstelen lake, where the ascent to Jochpass starts. In comparison with the first leg of the hike, the ascent is rather steep, but it is well worth it as it offers some amazing vistas on the way. The higher you get, the better the views. 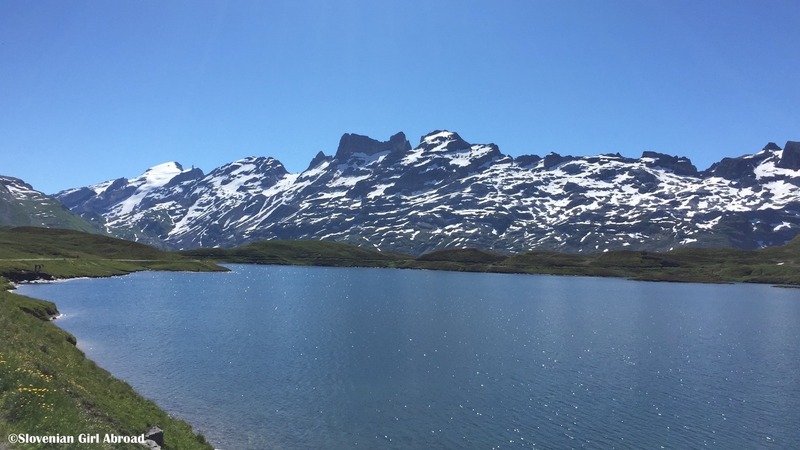 After you reach the Jochpass, you’re rewarded with the views over lakes you just passed on one side and the views over alpine meadows, the Lake Trüb and the majestic Mout Titlis on the other side. There is also a restaurant where you can take a break. From Jochpass the path continues downwards to the final lake of the hike – Lake Trüb (Trübsee). This section of the trail is rather steep. What made it even more difficult when we hiked it at the end of the June, was the fact some rather long sections were still covered with snow. I was very grateful for having hiking poles and wearing my hiking boots. Easier alternative to get up and down to the Jochpass would be taking the chair-lift. 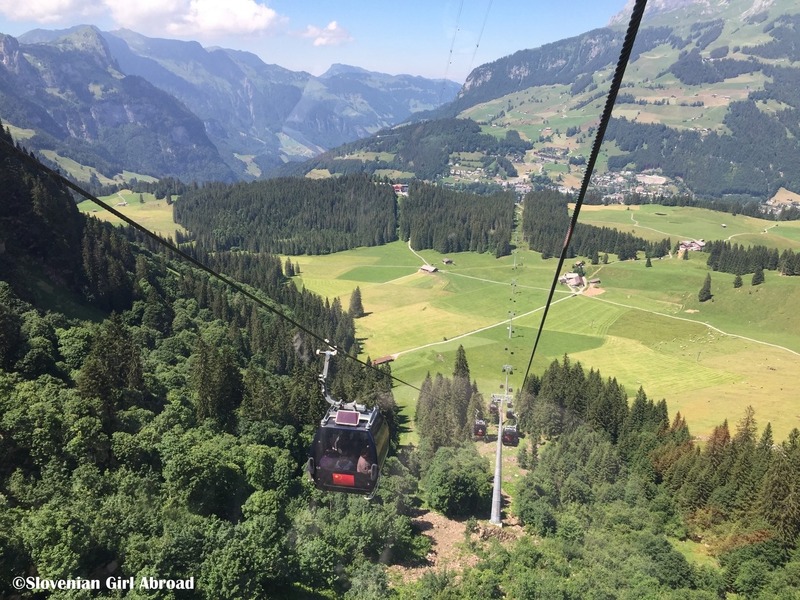 If you still have enough energy you can extend your hike by walking all the way down to Engelberg village or just hop on a gondola down to the valley as we did. 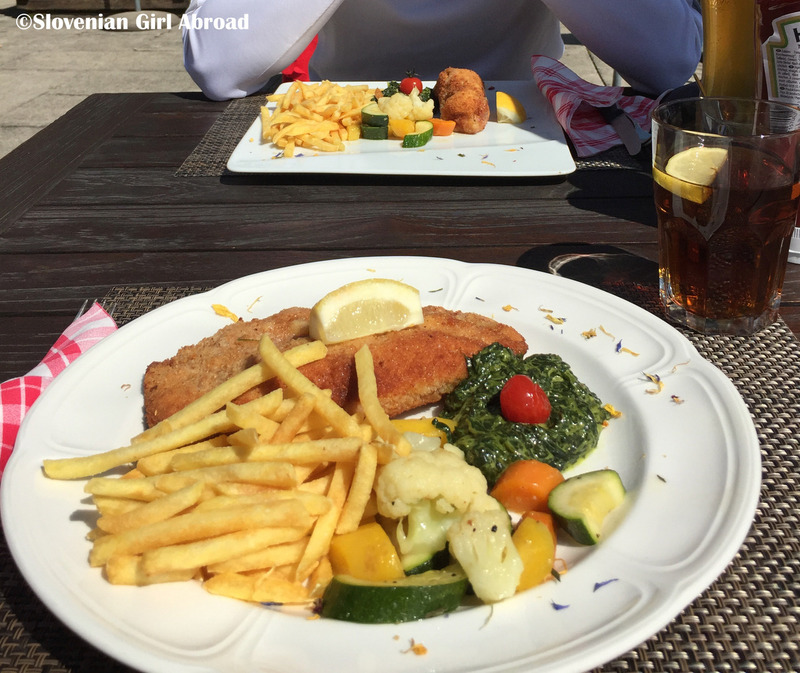 When we arrived to Engelberg it was already past the lunch time. We were hungry and decided to have a lunch in the village. We strolled around until we found the restaurant we were searching for and had delicious meal there. Tired but happy for another great hiking experience, we then took the train back home to Lucerne. We’ve done 4-Lake Hike once before. It was soon after my move to Switzerland, when we decided to give hiking a try. I wasn’t very fit back then and hiking a app. 14 km-long trail was a bit too much for me. I wasn’t able to complete the whole hike. 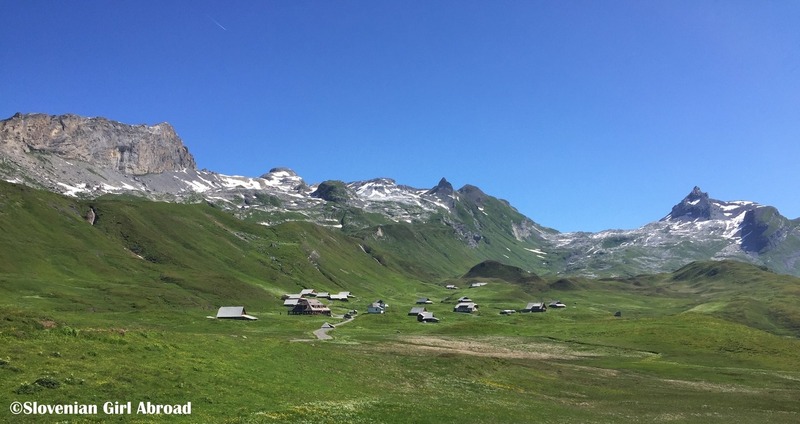 We’d skipped the final ascent and descent of the trail by taking a chair lift to Jochpass. Since then, years passed. I’ve changed my life-style and started to live more active. This year, I finally felt to be ready to conquer the whole 4-lakes hike trail and I’ve managed to do it. In fact, I found it much easier than I expected what makes me proud and happy. After hiking the 4-Lake trail two times, I can say it is one of the most beautiful and scenic hikes I’ve ever done. The landscape at this part of the Alps is just breathtaking. You can enjoy views over snow-capped mountains and deep blue mountain lakes all along the way. I also loved the fact the hiking trail doesn’t only ascents or descents, but varies, what, I think, makes it a bit easier to conquer. There are places to stop and eat/drink along the way, but I highly suggest taking a bottle of water and some snacks with you as the ascents can be quite strenuous. The hike can be done in both ways and should be snow-free from July to the end of October. HOW TO GET TO MELCHSEE-FRUTT? As start and finish of the 4-Lakes hike are two different places, I highly suggest using the public transport. 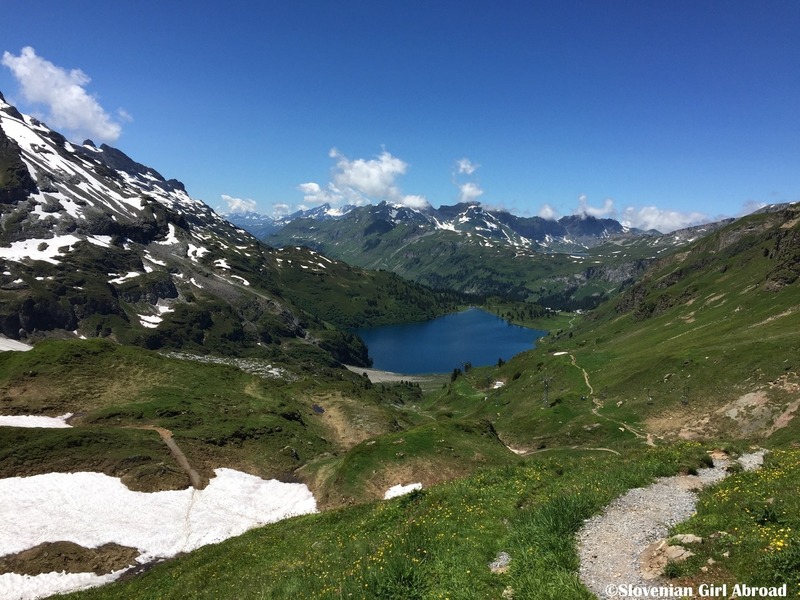 To get to Melchsee-Frutt by public transport take train to Sarnen. There change for bus (Postauto) to Stöckalp. At Stöckalp take the cable car to Melchsee-Frutt. 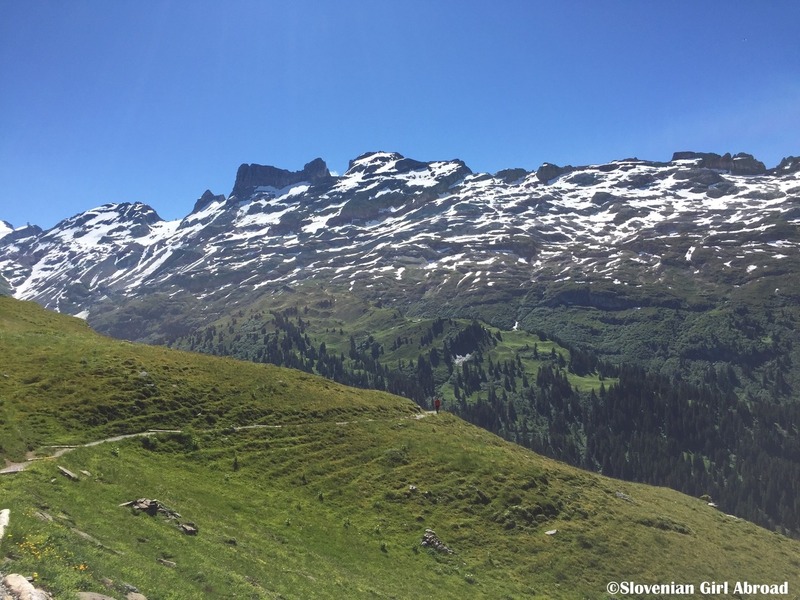 In case you would still like to travel to Melchsee-Frutt by car, take the A8 road and exit for Sarnen/Kerns. Follow the road to Kerns – Melchtal – Stöckalp. Free parking is available at Stöckalp. It traveling by public transport, check SBB page for special deals. Wow the photos are just breathtaking! I just love the photo of the cows. It is so typically Swiss. Your blog posts have inspired me over the years to try out hiking as I love the idea of walking, keeping fit while being rewarded with such beautiful views. I am visiting my home country Nepal in October, and hiking/trekking are very popular over there. I might give it a try this time. such a perfect place to go hiking. WOW! Simply – wow! Incredible photos! I especially love the outline of that mountain ridge behind Lake Tannen. Great post Urska. This is how people imagine Switzerland to be and you have brought that alive. I liked your “Hiking Companions” pic and the virtual 3D effect you captured. 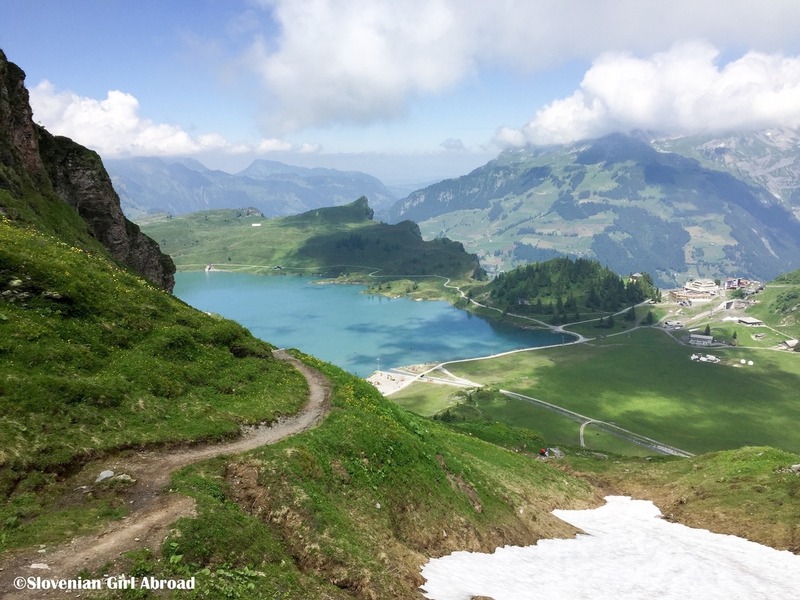 Another stunning hike that show off just how naturally beautiful Switzerland is. Great photos too. Thanks for joining us on #adventurecalling, we’re back open tonight for new posts. Wow, what a stunning hike! One to work up to, but well worth it by the sound of it. Thanks for sharing your experiences and tips Urška. 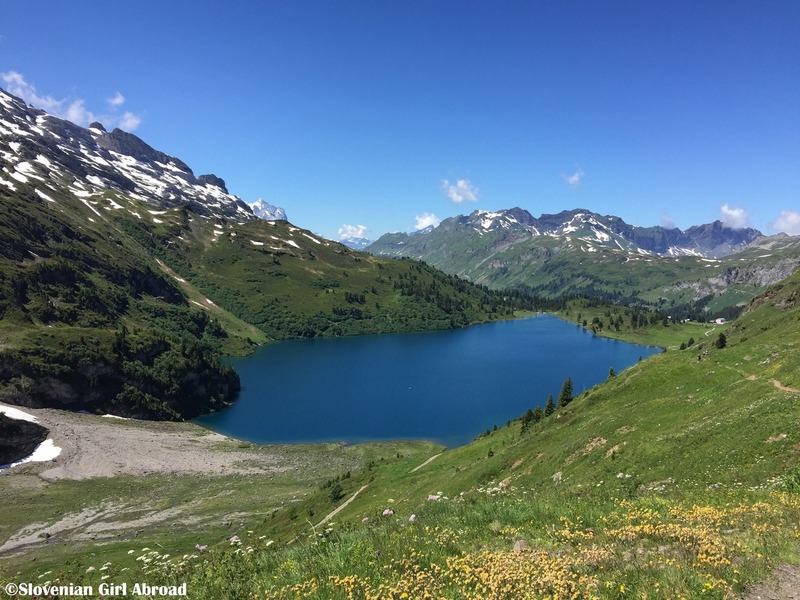 Yes, Switzerland is great in regards with the easy access to the mountains and stunning alpine hiking trails. 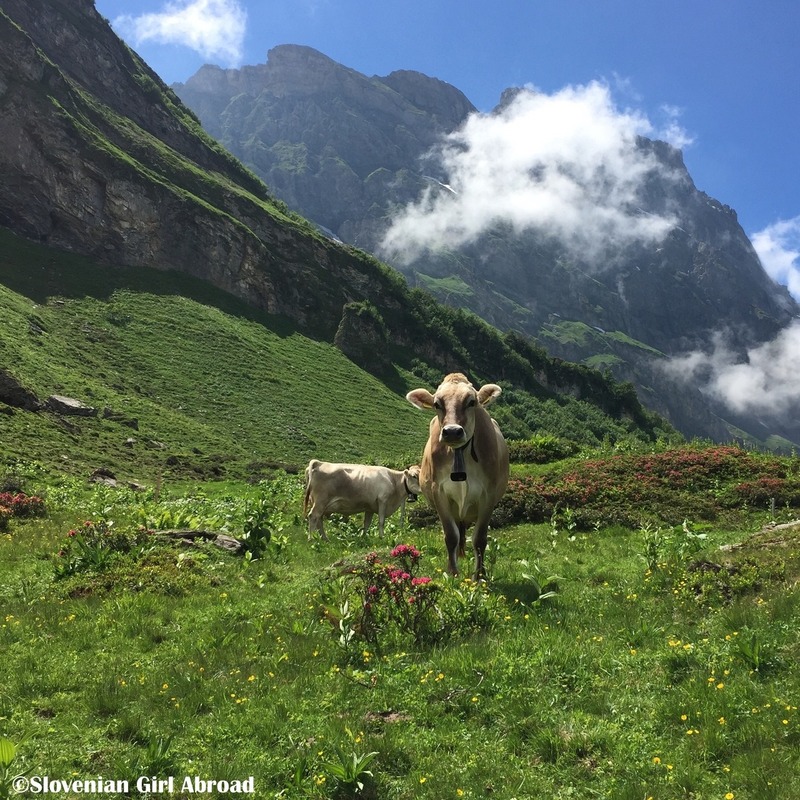 Cows are great travel companions too – their bells makes great music. 🙂 Thank you for your kind comment! This looks like a fantastic walk. 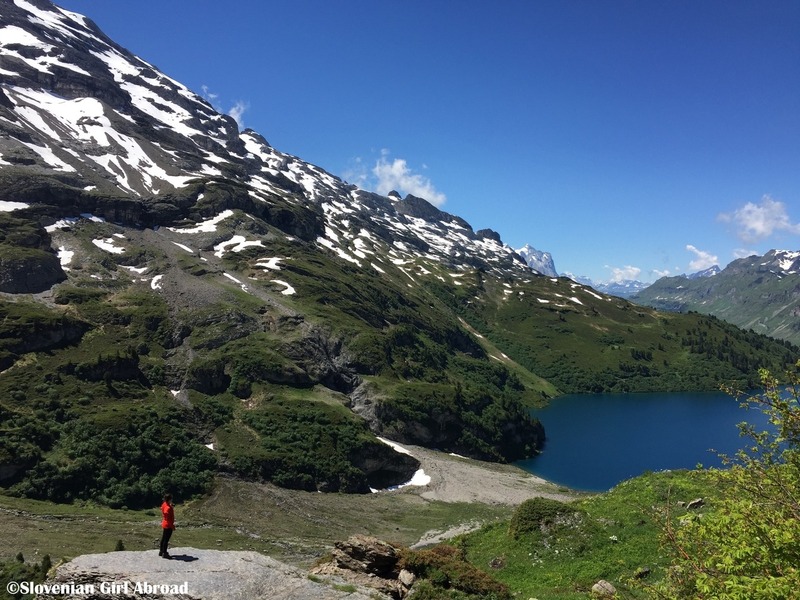 I love hiking in Switzerland and collecting 4 lakes on the way sounds like a great idea. I love that the trails all have huts where you can get lunch (and presumably a beer!) Great article, thanks. #farawayfiles. Oh Switzerland. You are sooo swoony. I knew when you posted this to #FarawayFiles link up that I would love it. As always, your photos are super. And what a beautiful day out. Well deserved lunch indeed. And how can you not love those moony eyed brown cows. Love. Thanks for sharing! Aww, glad to hear that Erin! Thanks!